Disney Interactive is launching a new original short film as part of a unique partnership with Google. Starting today through Feb. 23, the 38-minute video, ‘Blank: A Vinylmation Love Story’ will be exclusively distributed on Google Play—on the Web and via the Google Play mobile and tablet apps. Disney has made a push over the past several years to launch original video content on the Web that is inspired by existing company IP. For example, there was last year’s short-form series derived from the It’s a Small World ride. But with Blank, Disney seems to be aiming for Oscar-short-film territory than just looking to roll out a couple of Webisodes. 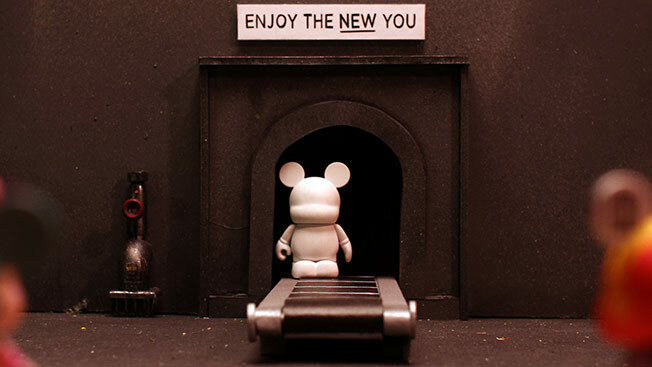 The film depicts a pair of Vinylmation toys—i.e., figurines sold in Disney parks that have become big among collectors—who are for some reason left blank, with no design or coloring (Vinylmation figures depict everything from ninjas to baseball players). Over the course of the film—shot in stop motion with music but no dialogue—the two blank Vinylmations fall in love. As part of the unique partnership, fans will be able to take screengrabs of Blank to share with loved ones as digital Valentine’s cards. According to Margie Gilmore, vp of Disney Interactive’s originals studio, there are over 2,000 Vinylmation designs; many collectors have already taken to creating DIY stop motion short movies. But the hope is that the sweet story of Blank has wide appeal beyond the collector crowd. Think a movie like Wall-E: aimed at kids, but carrying serious themes that adults can appreciate. Disney said that Google was looking to attach its brand to Blank, and was interested in showcasing the film globally (it helps that Blank has no dialogue, and thus no language barrier). Disney isn’t selling any pre-roll or any other ad opportunities for the film. But given the global goal, one might ask, why not distribute Blank on YouTube instead?